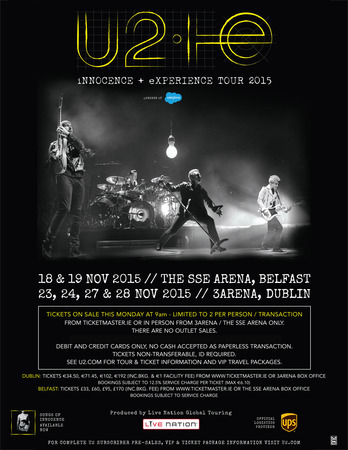 U2’s iNNOCENCE + eXPERIENCE European Tour 2015 will finish with six home shows in Ireland - two shows in Belfast on 18th & 19th November and four shows in Dublin on 23rd + 24th, 27th + 28th November. It’s a year since the band released Songs Of Innocence, an album exploring their earliest experiences of growing up in Dublin influenced by 70’s rock and punk and early 80’s electronica - and now they’ll be performing those songs to a home crowd for the first time. Tickets for the Irish shows go on sale at 9am on Monday 14th September, will be limited to 2 per purchaser and are priced from £30 to £165 for Belfast and from €30 to €185 in Dublin, plus charges. Tickets can be bought at the venue box offices and online. Paid subscribers to U2.com will be emailed details of presales. €2 million raised from these concerts will go to Music Generation, Ireland’s National Music Education Programme which currently provides high quality subsidised music tuition to some 26,000 children and young people. Music Generation was originally set up with €5m funding from U2’s 2009 shows at Croke Park, along with a further €2m raised by The Ireland Funds.